Not content to rest on the praise for their album Obelisk, released last year (with our review for it right here), Goya have put together about a half-hour more of stoner doom metal to satisfy the cravings of their fans. Opening with "The Enemy" and closing with an extended version of that same track, the band delivers crunchy bass-lines, crisp drums, and clanging cymbals over lyrics of loss and despair. Throw in some shreddy, mean-toned electric guitar with pedal effects, and you've got prime material for this genre. In between the two enemies, "Last" and "Light Years" provide their own growls. The first gives a more '70s-metal-flavored set of grooved aggression, sporting some gnarly riffage against singing with a modern level of menace. "Light Years" digs into a deeper riff, one that could almost be adapted from the main theme of a grimy old horror movie, and put the guitar-work on higher display while keeping the other elements strong. 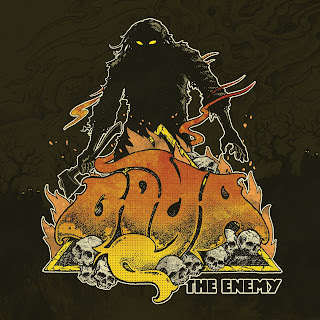 The extended "Enemy" comes in at the end, making for a nice way of giving listeners the further experience they'll surely be craving after those first three tracks, while also pointing the way to satisfaction by just giving a closer ear to the tracks already available. More guitar, more bass, more beatings from the drums right to your brain, and more manly wails of desolation. The EP will go live on Goya's BandCamp on the 15th, with a physical release possibly in the works, so start warming up your speakers to play this as loud as it deserves.